Deposit Methods: Bank Wire Transfer, CLICK2PAY, EcoCard, eWalletXpress, InstaDebit, Skrill, NETELLER, SEB Pank, American Express, eCheckUS, MasterCard, paysafecard, Visa, Cheque. 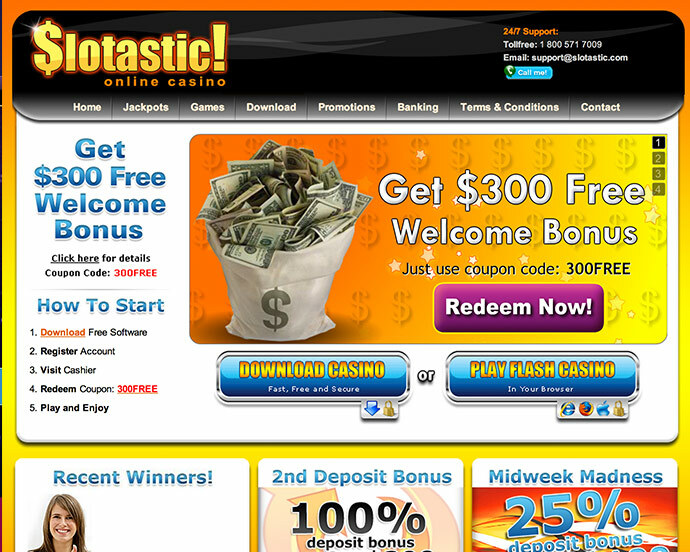 Slotastic Online Casino is a real money casino; therefore all players' winnings and losses are in real money. Players wishing to play the games for fun only can login to their account in fun mode. Slotastic Online Casinol makes every effort to ensure the full protection of its customers, personal identity and details of all members will remain confidential, Slotastic will not report the wagering history of any member. Players can find more than 300 fantastic Casino Games: Table Games, Slots, Video Poker & Progressives. A selection of games is available for free practice. Simply click on the the game you want to try out in the left-hand navigation and have fun without downloading or registering! Slotastic does not accept players from the following countries: France, Kentucky, Louisiana, Maryland, Missouri, New Jersey, New York, Washington.